This month saw the first of the Regional RCE Meetings take place, with the 8th African Regional Meeting held in Zomba, Malawi from 8-10 August, 2018. Stay tuned for a report of the event in the coming months. For those attending the upcoming European, Asia-Pacific, and Americas meetings, we look forward to seeing you there! Applications will open soon for the RCE Awards, where we honour and celebrate RCEs who have made outstanding contributions through ESD projects and programmes. Details on how to apply will be announced shortly. As always, if you have any news, upcoming events, or publications you would like to share in the RCE Bulletin, please complete this form and email your submission to the Global RCE Service Centre at rceservicecentre@unu.edu by the 15th of the month. 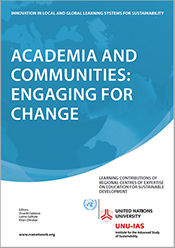 The Education for Sustainable Development Project at UNU-IAS has worked with RCEs worldwide to launch a new publication titled 'Academia and Communities: Engaging for Change'. 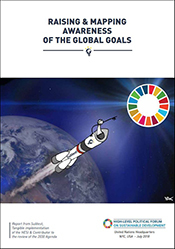 The publication, which was launched on 15 August, 2018, looks at the ways in which local development problems can be approached through a variety of ESD forms and practices initiated by the multi-stakeholder networks and which contribute to the ambitions of the GAP (Global Action Programme on ESD). These are presented in the form of RCE-led initiatives throughout 17 chapters which demonstrate the engagement between knowledge institutions and communities. A big thank you to all of the RCEs involved in this publication for your invaluable contribution! The publication can be downloaded here. Student leadership in sustainability cannot be achieved single-handedly - in order to develop these competencies it is essential that students are empowered to collaborate and share their ESD knowledge at the global level. RCE Penang, Universiti Sains Malaysia in collaboration with the School of Educational Studies (USM), Penang Education State Department, RCE Tongyeong, RCE Greater Dhaka, RCE Goa, and RCE Yogyakarta will bring together school students from across Asia-Pacific to share and exchange ideas on issues relating to sustainability, focusing on specific themes such as Biodiversity, Sustainable Consumption & Production and Climate Change. The online conference is open to all to participate. Registrations can be made here. The first three weeks will be for sensitisation, document sharing and training of the participating schools and students. The frame will be divided into four stages: the general, quarter, semi, and final stages, and will be live, to be televised across Nigeria on African Independent Television (AIT). Every session of the quiz will have a quizmaster, commissioner and the judges' panel, which will be drawn from RCE Kano, RCE Kano's member institutions and other RCEs in Nigeria. The concept note and flyer for the event can be viewed here. 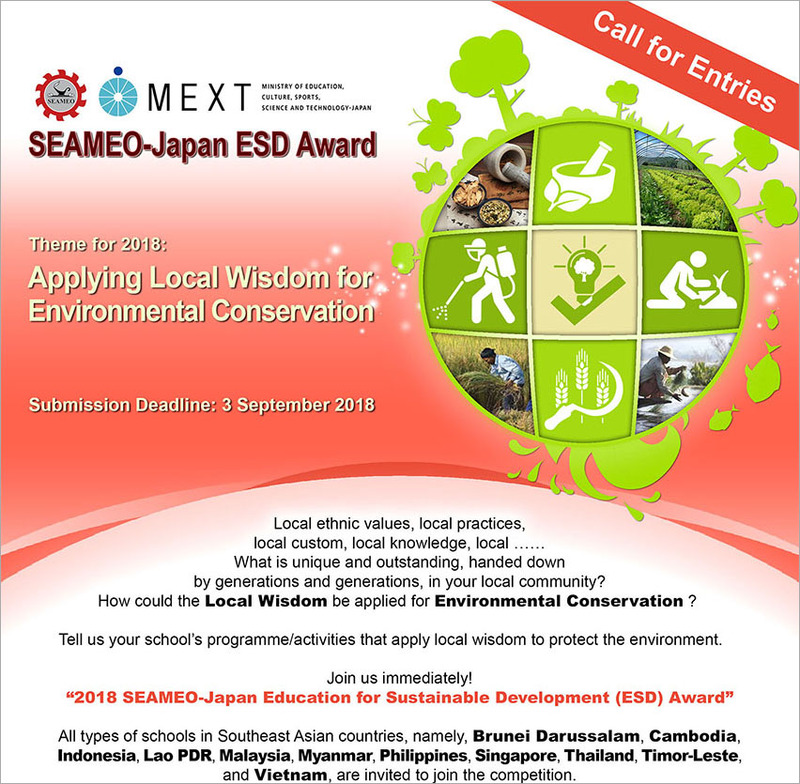 The Southeast Asian Ministers of Education Organization (SEAMEO) and the Ministry of Education, Culture, Sports, Science and Technology, Japan (MEXT) in cooperation with UNESCO Bangkok - Asia and Pacific Regional Bureau for Education are pleased to announce the 2018 SEAMEO-Japan Education for Sustainable Development (ESD) Award, with the theme 'Applying Local Wisdom for Environmental Conservation'. The award is open to all public and private kindergarten / elementary / secondary / vocational and technical schools within 11 Southeast Asian countries (Brunei Darussalam, Cambodia, Indonesia, Lao PDR, Malaysia, Myanmar, Philippines, Singapore, Thailand, Timor-Leste and Vietnam). Eligible schools with programmes, projects and activities related to the theme are invited to apply. The school awarded 1st prize will receive USD 1,500 and a study tour to Japan, with prizes of USD 1,000 and USD 500 for 2nd and 3rd prizes respectively. The deadline for submissions is 3 September, 2018. Further information and details on how to apply can be found here. RCE Penang recently held seminars focusing on the themes of the SDGs, ethics and celebrating diversity. The first was held at the end of June 2018, in collaboration with the School of Educational Studies, Universiti Sains Malaysia and RCE Tongyeong. 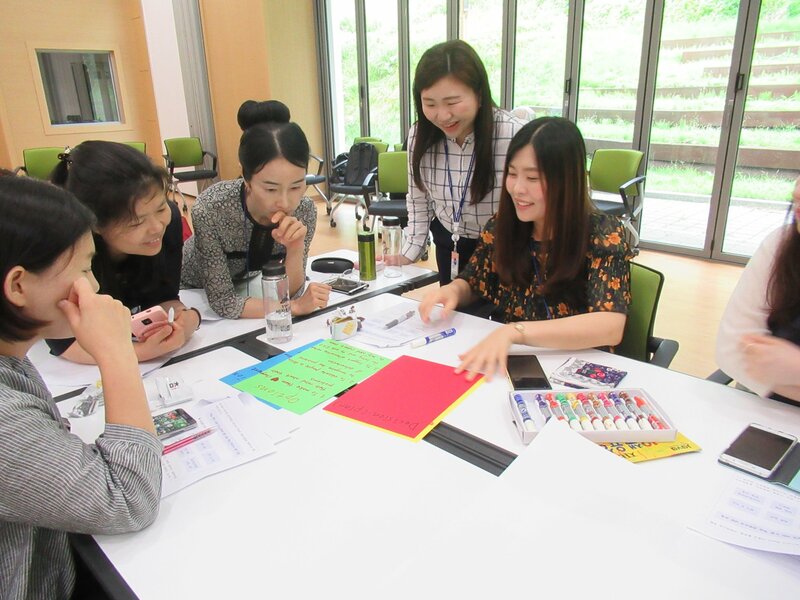 Local school teachers from Tongyeong city were led through a workshop which aimed to lead the teachers to be agents of change for the SDGs through ESD. Teachers are key in order to drive ESD pedagogical practice, and thus being equipped with the skills and knowledge to nurture and foster this is paramount. Workshop activities were specifically designed to help teachers in dealing with issues associated with cultural diversities and developing a sense of autonomy throughout the ESD process. The Sustainable Literacy Test (Sulitest) has released its 2nd Annual Report to the UN High-level Political Forum. The report highlights Sulitest's currently available tools and how they are being used, as well as the projects which have been deployed, are in development or that are planned. Observations on global awareness of the 17 SDGs are also featured, including trends and indicators based on this past year’s International Core module global test results. Read the report here. In addition, Sulitest has launched two new modules (SDG 7: Affordable and Clean Energy and SDG 11: Holistic Waste Management), available at Sulitest.org for universities and organisations. NYC has become the first city in the world to submit a review of its progress directly to the United Nations during the High-Level Political Forum (HLPF). 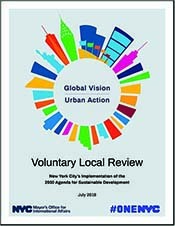 Modelled after the Voluntary National Review (VNR) that countries are invited to submit to the HLPF every year, NYC’s Voluntary Local Review (VLR) highlights the city's sustainable development achievements since 2015, translating its local actions to a global audience, with a focus on the five priority Goals for the 2018 HLPF. Read more and download their VLR here. The city's OneNYC strategy, including its goals, targets, initiatives and connections to the SDGs can also be viewed in the publication, 'A City with Global Goals', produced by the NYC Mayor’s Office for International Affairs, available here.